Have you lost critical business information, personal pictures or memories due to an unreadable, formatted or damaged memory card? In most cases if you have not planned ahead with back ups, your data can still be recovered. If you have been using the media in an attempt to recover the data, it is a good idea to stop to eliminate further damage and ensure the greater likelihood of a recovery. USB Key, SD Card, PC Card, CompactFlash I/II, SmartMedia, Memory Stick, Memory Stick Duo, Memory Stick PRO Duo, Memory Stick PRO-HG Duo, Memory Stick Micro M2, Multimedia Card, Reduced Size Multimedia Card, MMCmicro Card, Secure Digital Card, Universal Flash Storage, miniSD Card, SxS, microSD Card, xD-Picture Card, Intelligent Stick, Serial Flash Module, µ card, NT Card or other Flash Media product can be recovered. For data recoveries we have a no data, no charge policy. This means that if we cannot get any data back, you don't pay a cent. 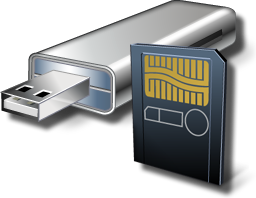 Depending on the damage to the flash drive this service can takes 1 to 2 business days.